Open View: One More Problem Due to Overweight! Adding to the list of problems caused due to obesity is the recent announcement by Air France. They have said that from next month, obese customers can reserve two adjacent seats for a comfortable journey with the second seat at a 25% discount. I really wonder how the mind of an obese person works. How will the person feel when he/she can't get up or sit down or bend down or heck even walk around for that matter without getting drenched in one's own sweat! How bulky and heavy will he feel? 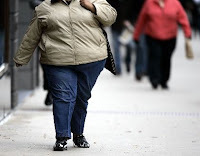 They will have to manage a host of other issues that comes free with obesity ranging from being the object of ridicule at every place to coping up with a host of diseases that obesity causes. Time and again they try to slim down by following various methods like taking up tablets, going to the gym regularly even if they had hated physical work all throughout their lives etc. Some even go the extent of surgery. I feel sad for them. So much of work, attention and time you need to give to your body which a normal person will not generally. I always asked myself this question 'when such announcements come, won't it hurt the ego of overweight people?' Though it is done for the benefit of everyone I always asked myself this question because it is one more reason to make fun of your overweight friend. But there are some advantages with being slightly obese. They look cute and adorable. They are smooth, round and soft where. You can find only curved edges on their body! Girls and kids love them! When all of this congregates what kind of a mind set is formed? An embodiment of confidence and courage to fight all the negatives of it throughout lifetime? A carefree attitude to just enjoy the brighter part of it and just accept the dull side? A completely asocial nature? Its mind boggling! Whatever be it we always love our overweight friends and its true!